Pre-Measured Mint Flavored Foil Packet. 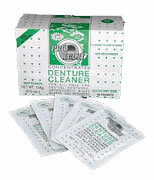 While there are many denture cleaners on the market there are only a hand full that really clean. Most are simply a chlorinated wash that bubbles and "bleaches" dirty deposits and build up without helping to actually remove them. Professional cleaners, like those used in dental offices, help dissolve build up and disinfect. Professional dental appliance cleaner available by convenient on-line shopping. Not available in stores. 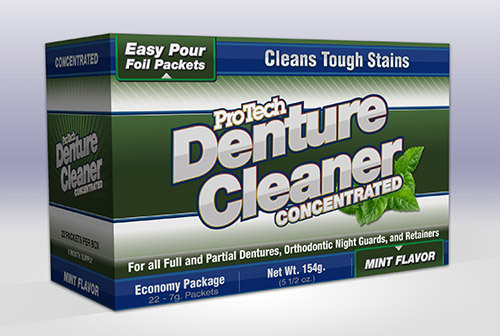 Try ProTech® denture cleaner for 30 days. If you don't agree this is the best dental appliance cleaner on the market just return the unused portion for a refund. *Not Recommended for use on partials fabricated from Ticonium® Alloy. Simply mix one packet (1\4 oz.) in a cup of warm water. Allow the solution to stand for (3) three minutes after stirring thoroughly. Lightly brush dentures to remove food particles etc., then soak the denture for 15 to 20 minutes. A severely stained denture may require an overnight soaking (soft reline cases should be limited to 20 minutes). Brush away loosened deposits with a soft brush and rinse thoroughly. Buff denture by drying with a soft terry cloth. Use daily for best results. IMPORTANT After mixing the contents of a packet of ProTech® Prosthetic Cleaner, the resulting solution will remain effective for a week to 10 days, or more! It is not necessary and it is uneconomical to discard the solution daily. CAUTION ProTech® Cleaner is a powerful stain remover which can be harmful to tissues and mucous membranes if used in direct contact. Do not put solution in mouth! Use solution only as directed. Always rinse thoroughly. Keep away from children.